Internet Express Password Recovery Software retrieve all internet explorer or any windows application saved passwords including FTP passwords, AutoComplete passwords, identities password, online billing passwords, IE Auto Form and AutoComplete fields passwords instantly. Software recover Internet Explorer saved passwords including of mail accounts along with the login name. Password Recovery program recovers misplaced or lost passwords of all your email accounts such as online shopping, web forms, subscription forms, search engines or any other password-protected application. Software recovers login and passwords for any emails account or any websites and web-based applications. Support all types of internet explorer saved passwords and restore FTP passwords, AutoComplete saved passwords from IE Auto Form and AutoComplete fields. Internet Password Recovery tool restore passwords stored by Internet Explorer browser with support to all major versions of internet explorer. 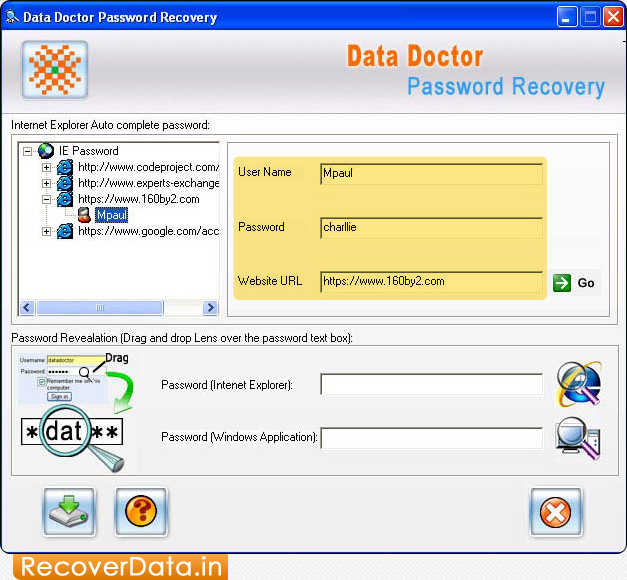 IE Password Recovery utility allows you to save recovered passwords at user specified location.